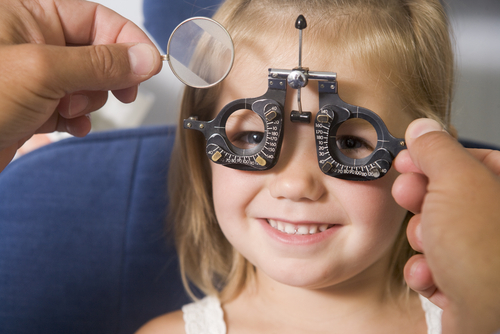 When Does Your Child Really Need Their First Eye Exam? If you’re dependent on your province’s health care plan, taking your child to the optometrist can be a mix of excitement — look how old they’re getting already! and dread — please, please, please have perfect vision. It’s no secret that annual eyewear can set an uninsured family back. But when does your child really need their first eye exam? It may surprise you to hear that many medical authorities suggest having your child’s eyes tested as early as 6 months. Of course, this first appointment isn’t going to involve your infant sitting in a high chair reciting random letter from a chart on the wall. This eye exam only looks at the bare basics of eye health. At your baby’s appointment, the optometrist will confirm that your child’s eyes react to light, are able to focus, and follow a moving object. They’ll check for any signs of disease and make sure their eyes are straight. Some of these initial tests will be performed during your infant’s doctor exams, but it’s still a good idea to see an eye specialist before your child’s first birthday. After this first 6 month exam, you’ll likely want to bring your toddler in around 3 years old. At 3 years old, your optometrist will check general eye health again, make sure that none of the common childhood eye problems are beginning, and even access your child’s ability to focus. Instead of letters, young kids will look for apples, barns, and other known objects. If your toddler gets a clean bill of eye health, you won’t need to bring them back until they’re 5 or 6 — or within the first couple years of school. Experts suggest that around 25% of school-aged children have vision problems and not being able to see the classroom’s whiteboard can really set kids back. It’s important to have a child’s vision checked every 2-3 years. If your child already wears glasses, they should have annual appointments. Is it time for your child’s first eye exam? Nervous about how your family will manage the cost of glasses? Health Risk can help! We have the coverage you need and offer our health plans to Canadians coast to coast, so whether you’re in Nova Scotia or British Columbia, you can bring your child for their eye exams with the confidence.